A relatively new term to emerge in the composting industry is “food scraps” which includes two general categories: 1) pre-consumer food scraps; and 2) post-consumer food scraps. Pre-consumer food scrap composting includes vegetable culls and trimmings from restaurants, college dining halls and the produce department at your local grocery store. This term even includes used coffee grounds from the corner latte stand. Post-consumer food scrap composting includes domestic food that is discarded and often co-mingled with yard debris and then collected at the curbside. As it turns out, food scraps constitute a relatively large percentage of the organic waste-stream that can be diverted from the landfill. As a result, cities, counties and states have invested a tremendous amount of time and attention on recovering and composting food scraps. One of the significant challenges with food scrap composting is the comparatively high incidence of plastics contamination. Small items such as rubber bands and the small white labels put on apples are the bane of the composter’s existence. Add to these small items the plastic wrap that surrounds the discarded head of cauliflower or the stale loaf of bread that is still in its bag and the problem becomes very obvious. The compost consumer simply doesn’t want trash in their food scrap compost. The solution to this dilemma is public education and cooperation. 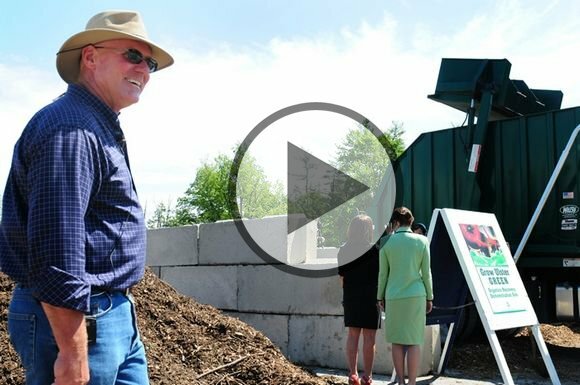 O2Compost has helped conduct numerous food scrap composting projects for both private and public sector composting facilities throughout the USA and Canada. We are also now working with colleges and universities coast to coast as well as non-profit, urban roof-top farms in such places as New York City. O2Compost worked closely with OCRRA (2009‐Present) to develop a large‐scale food waste pilot project at the Amboy Compost Facility near Camillus, New York. The focus of this project was to demonstrate the viability of composting using the aerated static pile method in extreme cold weather conditions. The project was closely monitored by OCRRA staff as well as the faculty of Cornell University. This pilot project was very successful and plans are being developed for converting the entire facility over to an aerated system. outside the city and the finished compost is used on local farms. This system is powered by solar energy. O2Compost was hired in 2011 to design an aerated bay compost system to process food waste from a minimum security facility. This compost system was intended to 1) reduce off‐site disposal of source‐separated organics in an effort to enhance sustainable practices; 2) serve as a demonstration site for other prisons; and 3) provide an opportunity for inmate training. The program is considered a resounding success, with plans to expand to process food waste generated by 9,000 inmates. In 2006, O2Compost completed an extensive pilot demonstration project in support of the U.S. Army’s goal of zero discharge from military bases. The objective of this project was to evaluate the compostability of a wide range of organic waste materials, including biosolids, municipal green waste, food waste materials, horse manure, and petroleum‐contaminated soils. St. John’s has achieved a Gold Rating with the AASHE(1) STARS(2) Program, in part because of their efforts to: 1) collect food waste from university dining halls and coffee shops, 2) compost it on‐campus, and 3) utilize the finished compost in sustainable landscape practices and in a student organic garden. By composting on‐site, St. John's has reduced its carbon footprint by eliminating the need for the Department of Sanitation to transport food waste to a landfill, thereby significantly reducing both truck exhaust and the production of landfill greenhouse gases. O2Compost served as compost sub‐consultant to Parametrix, Inc. for the design, construction and start‐up of a compost facility located at the Walla Walla State Penitentiary (2003‐2004). This project included facility sizing and conceptual layout, assistance with detailed design, bidding, and construction management. Following construction, O2Compost conducted on‐site personnel training and follow‐up process monitoring and troubleshooting services. The permit application for this project was the second to be prepared under the State’s new solid waste handling regulations. Peter Moon served as the lead engineer for the design, construction and start‐up of a compost facility that was designed to process yard debris from Quincy and Moses Lake. This project included facility sizing and conceptual layout, permitting, construction assistance, operator training, and start‐up. Contact Us to find out if Food Scrap Composting is a practical solution for your facility.